The dirty little secret of GPU marketing is that laptop graphics chips are never as powerful as you'd think. 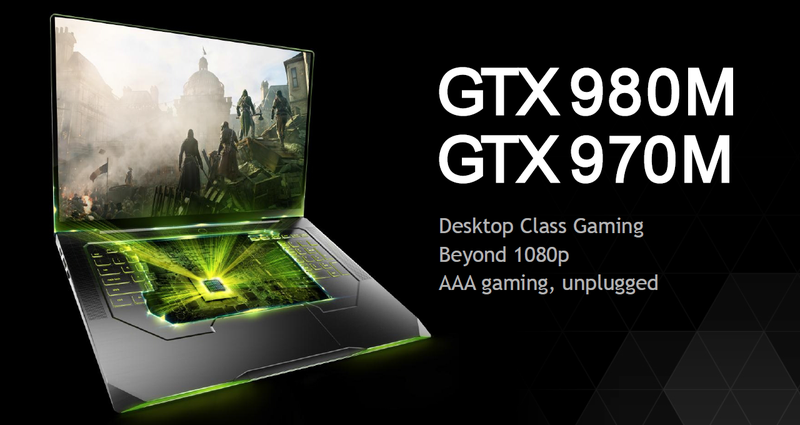 Think you're going to run a game maxed out at 2K resolution with the GeForce GTX 880M in your laptop? Think again—even if it's no trouble for a desktop-grade GTX 780. Even just compared to last year's model, the 1,536 processor cores provide a bigger jump in mobile GPU performance than we've seen in a while. While the GTX 880M was just a 15% boost over its predecessor, Nvidia tells us the new Maxwell-based GTX 980M is a 40-50% increase on average — and that's in addition to the additional battery life you might see from the more efficient architecture. That's because the GTX 980M (and 1280-core GTX 970M) are Nvidia's second attempt to let you actually game on a laptop while unplugged. With Battery Boost 2.0, the company claims it can deliver well over an hour of gameplay, even in demanding games like Tomb Raider, at high settings. Like before, Battery Boost artificially lowers your framerate to save power, but it also requires a fairly beefy laptop to begin with. You can't save power by slowing down the chip if it's already straining to keep up with your game. Other than Battery Boost, you'll also have access to all the potentially impressive features Nvidia announced for its desktop chips: Dynamic Super Resolution for increased fidelity, the new MFAA anti-aliasing technique for fewer jagged edges, and the impressively realistic Voxel Global Illumination lighting... assuming any game developers take advantage of that. The new chips should be available in pricy gaming laptops today, including the five you see in the picture below, as well as the MSI GS70, the Gigabyte P35, and the Clevo P650.